We’ve seen the same mass shooting narrative play out time and time again. The tragedy occurs, the news media cover it for a while, there is some obligatory discussion of remedies, and eventually the story fades from our national consciousness and nothing changes. The students at Marjory Stoneman Douglas High School in Parkland, FL flipped that script. Rather than grieve, they asked: “What’s next?” They have devoted their platform, their voices and their passion to create change to ensure nobody else has to endure what they have. They organized the global March for Our Lives to protest gun violence and encourage voter registration. 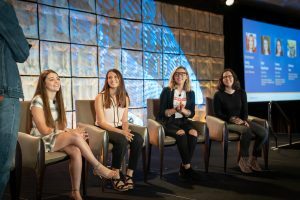 At this year’s Annual Conference, Page welcomed four students from Marjory Stoneman Douglas and the March For Our Lives movement: Sari Kaufman, Casey Sherman, Delaney Tarr and Sofie Whitney. Each described her journey from tragedy to activism, urging our membership to take part in the cause and establish voting incentives for both their employees and external stakeholders alike. This edition of The New CCO podcast features the discussion with those students. Listen to the episode below. If you’re interested in more conversations like this on The New CCO, subscribe on iTunes and Spotify. Do you have a story to tell? Share it with us. Please reach out to Justin Pallenik at jpallenik@awpagesociety.com with your CCO story.